I found these pictures of a firefighting robot at Hacked Gadgets. 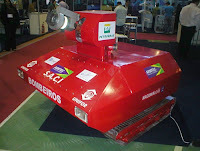 The Brazilian company ARMTEC has created this firefighting robot. The SACI (Incidents Support Combat System) robot brings the firehose directly into the fire or sprays water or foam from 60 meters. The robot can work for 3 hours before it needs a recharge.